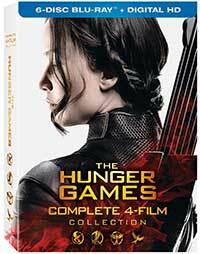 This complete 4-Film collection brings together the entire on-screen saga based on the Suzanne Collins trilogy of YA novels. The Hunger Games started things off by introducing the world to protagonist Katniss Everdeen as portrayed by Jennifer Lawrence (Best Actress, Silver Linings Playbook, 2012) and started the story of the star-crossed lovers Katniss and Peeta, who would eventually go on to be taken prisoner in the capitol city of Panem and brainwashed by the ruthless President Snow (Donald Sutherland). Over the course of the four films, Katniss and her band of friends break free from the brutal hunger games, unite the various districts that have been pitted against each other by the wealthy elites in the capitol, and launch a rebellion against Panem, with Katniss at the head as a symbol, the so-called Mockingjay, for the “plebs” as it were, to rally around. today, of warfare, of the divide between the rich and the poor. While the films do not necessarily capture these grievances given their abundance of special effects, teen melodrama, and often superfluous violence, they can still be an entertaining set of popcorn movies. And Jennifer Lawrence is without doubt the Hollywood “it” girl of the moment. The films contain young and veteran who’s-who Hollywood actors including Jennifer Lawrence, Donald Sutherland, Josh Hutcherson, Woody Harrelson, the late Philip Seymour Hoffman, and Julianne Moore. The Hunger Games films are digital productions, for the most part, shot in 4K and presented in a 2.40:1 framing, except for Catching Fire, which has a variable 2.40:1 and 1.78:1 framing for its IMAX sequences. Each disc is encoded in 1080p AVC and they each look very, very good. The image is clean, detailed, and pretty much what you would expect from such a big budget contemporary franchise on Blu-ray such as this. You won’t be disappointed by the color reproduction, special effects, and nuance in the shadows. This collection, as good as it is, is a prime candidate for the new 4K formats, but if you’re not eager to jump into a new format anytime soon, this will suit you just fine. newfangled Atmos mixes (backwards compatible with Dolby TrueHD 7.1). The previous films all have, if not quite as engulfing, certainly just as entertaining and dynamic DTS-HD Master Audio 7.1 mixes that are just as aggressive, atmospheric and dynamic, with clear dialogue, solid effects in the surrounds and deep but well handled (read: not unwieldy) low end. The Atmos mixes make good use of the additional Atmos channels, of course what individuals hear will vary depending on how many channels and where you have them placed. This set comes stuffed with bonus material. Some of the extras from the individual releases is repeated on the Bonus Disc, which seems an odd waste of space, but there is also a lot of new material, like never before seen deleted scenes and featurettes. While I am not a great fan of The Hunger Games films, I can admit they have had an impact on the younger generation of filmgoers and may have the sort of far-reaching effect that a franchise like, say, Harry Potter has had on some. Its biggest impact is putting forth a strong female character that did not have to be masculinized in order to become a hero or be considered strong. So, score one for the younger generation of women. The Hunger Games Complete 4-Movie Collection delivers fantastic value and entertainment with excellent picture and sound, and a boatload of bonus content.